MODEX, the largest supply chain show in North America, is delivering the latest in material handling solutions. Over 800 exhibitors have set up in the Georgia World Congress Center, here in Atlanta, Georgia. With 250,000 square feet of the latest technological advances in material handling, it can quickly become overwhelming. Hytrol, a world leader in the design and manufacturing of advanced conveyor systems, controls and solutions for customers with processing, manufacturing, warehousing and distribution needs, has released 8 Tips to Get the Most out of MODEX. Since their founding in 1947, Hytrol has demonstrated an unwavering dedication to understanding the material handling needs of businesses in varying industries. From a single conveyor unit to a comprehensive material handling system, Hytrol creates world-class solutions with world-class service. Hytrol stands out with their commitment to their strong integration partner network, their devotion to design and innovation, and providing on-going support with best on-time shipping. Durability, reliability, and quality have cemented their reputation as a material handling solutions provider. 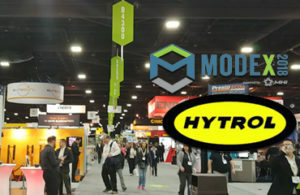 If you are the trade show floor be sure to stop by the Hytrol booth at B3219 during your visit this April 9-12 and let them know how you utilized their 8 Tips to Get the Most Out of MODEX. Hytrol provides material handling solutions that move the world. They are experts in designing, developing, and delivering the most advanced material handling systems to drive operational success. As part of the Hytrol family, their integration partners and employees improve the quality of life for consumers through valuable interaction, real-time support, and a commitment to innovation.